Keith Jarrett turned 70 in May this year. The birthday milestone has been marked by new releases from ECM, the news that the legendary Standards Trio has called it a day and now, in retrospective mode, a neatly packaged set of CDs, his first five releases as a leader, originally on the Atlantic and Vortex labels. The individual discs nestle satisfyingly in cardboard sleeves with the original LP artwork on them (although the liner notes and credits are rendered nearly indecipherable without a magnifying glass). Listening to the first notes of Lisbon Stomp, the first track on 1967’s debut album Life Between the Exit Signs, is startling. 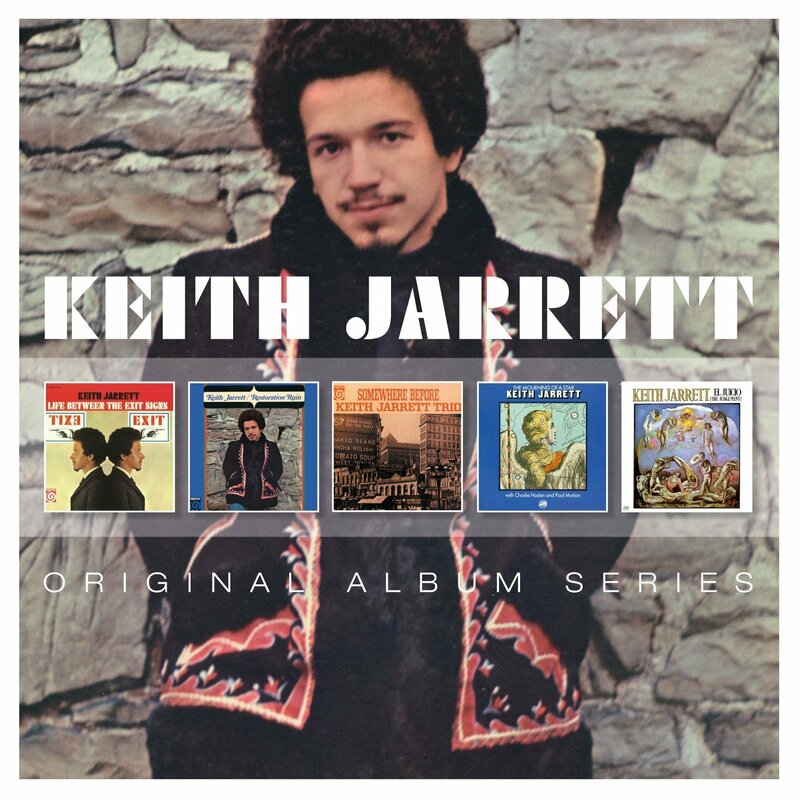 It was recorded nearly fifty years ago after Jarrett had spent a year touring the world with Charles Lloyd’s Quartet and released whilst he was still only 22. The opening track seems now like quintessential Jarrett with a hint of a boppish turn in the melodic phrase, an exuberant rocky flourish to resolve the harmony and slivery, fluid runs launching the improvisation. Somehow, the sound from a slightly dead sounding piano is unmistakably his. It’s as if he emerged fully formed with a distinct voice at the very beginning of his long career. Although these albums have been available separately in this edition, it is striking however to listen to them collected together. The output from the trio with Paul Motian and Charlie Haden and then quartet with the later addition of Dewey Redman on tenor sax, spans the years 1967 to the early 70s whilst Jarrett was a sideman with Charles Lloyd and then with Miles Davis. That first album showcases his already developed lyrical side and instinct for shifting melodic harmony on the standard Everything I Love and pretty waltz Margot. There are also freer torrents of notes and abstraction, the understanding and responsiveness of the trio evident on the closing track Church Dreams. The spirit of exploration is very evident on the later releases The Mourning of a Star and El Juicio, the latter with Dewey Redman. There are trance-like episodes with everyone playing steel drums, tunes that became live staples like Everything that Laments and Piece for Ornette, the melodies providing a launch pad for extended group improvisations, often with Jarrett on soprano sax as well as piano all interspersed with trademark blends of rocky, country like grooves. Restoration Ruin, the second album in the collection, is startling in an altogether different way. It’s a collection of songs, generally in a folk rock idiom with Jarrett playing all instruments (a venture he was to repeat more than once in later years) mainly saxes, guitars and percussion and singing: A curiosity now, but a pointer to some of the musical currents feeding his imagination. These recordings stand on their own still, even if they are not his finest work. It’s an exciting journey to re-visit and a reminder of what a remarkable creative unit the American Trio and Quartet was.